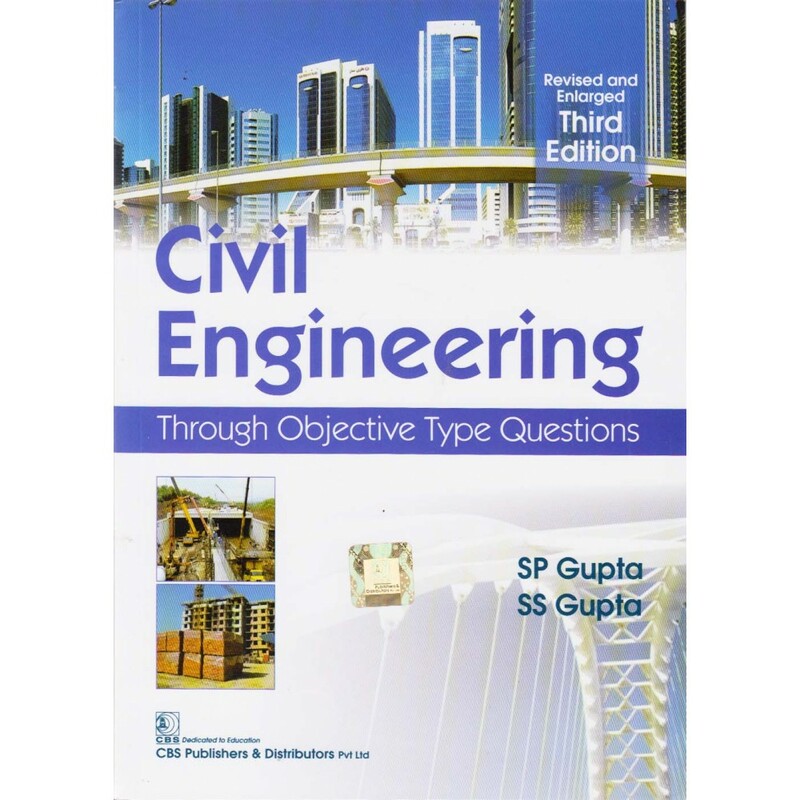 This edition has been thoroughly revised and enlarged by including questions which appeared in the competitive examinations for Civil Services and Engineering Services conducted by UPSC and also from GATE conducted by IIT. The book was highly appreciated by the readers from all nooks and corners of the country. 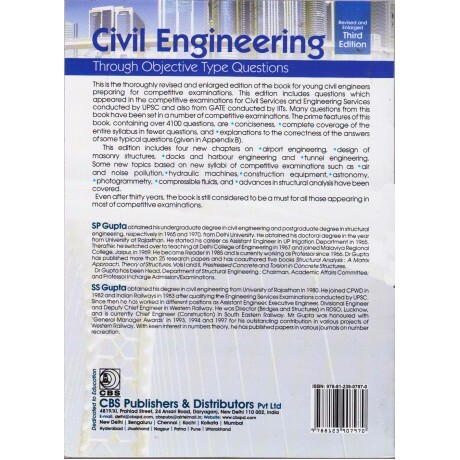 A large number of questions from the book appeared in the competitive examinations. The main features of the book were its conciseness coverage of entire syllabus in fewer questions and the Appendix B giving explanation to the correctness of a particular answer for some typical questions. Even after fifteen years the book is still considered to be a must for all those appearing in all sorts of competitive examinations. S.P. Gupta obtained his undergraduate degree in Civil Engineering and postgraduate degree in Structural Engineering in the years 1965 and 1970 from Delhi University. Mr. Gupta obtained his doctoral degree in the year 1985 from the University of Rajasthan. He started his career as Assistant Engineer in U.P. Irrigation in the year 1965. Thereafter he switched over to teaching at Delhi College of Engineering in 1967 and joined Malaviya Regional Engineering College Jaipur in 1969. He became Reader in 1985 and is currently working as Professor since 1996. Dr. Gupta has published more than twenty-five research papers and has coauthored five books viz. Structural Analysis-A Matrix Approach Theory of Structures Vol. I and Vol. II published by Tata McGraw-Hill Prestressed Concrete and Torsion in Concrete Structures published by CBS Publishers & Distributors. Dr. Gupta worked in the past as President Library; President Games and Sports and Coordinator Administrative Affairs. Currently he is working as Head of Structural Engineering Department Chairman Academic Affairs Committee and also as Professor Incharge (Admission/Examinations ). S.S. Gupta obtained his degree in Civil Engineering from University of Rajasthan in the year 1980. He joined CPWD in 1982 and Indian Railways in 1983 after qualifying the Engineering Services Examinations conducted by UPSC. Since then he has worked in different positions as Assistant Engineer Executive Engineer Divisional Engineer and Deputy Chief Engineer in Western Railway. He occupied the post of Director (Bridges and Structures) in RDSO Lucknow from 1998 to 2000. Currently he is working as Chief Engineer (Construction) in South Eastern Railway. Mr. Gupta was honoured with General Manager Awards in the years 1993 1994 and 1997 for his outstanding contribution in various projects of Western Railway. Mr. Gupta has keen interest in number theory and published number of papers in various journals on number recreations.